Sankalp Creation specialist in Digital Textile Fabric Printing & Embroidery Services. It not only has high speed printing performance but also produces subtle tints, tones & color gradients accurately, giving you unlimited colors on your choice of fabric. 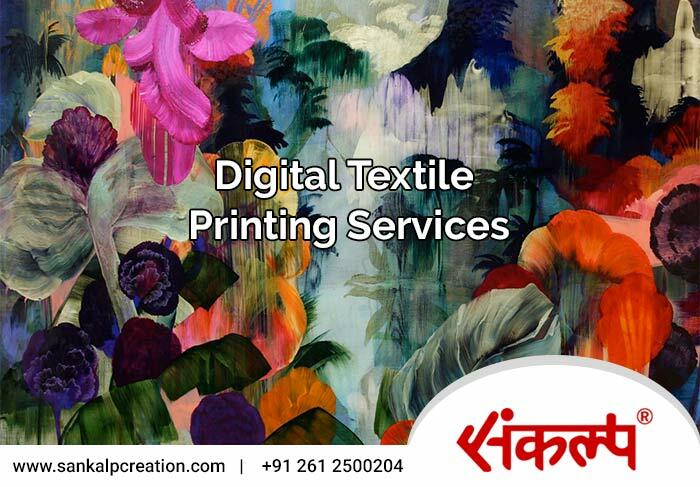 We at Sankalp Creation employ the very latest digital print technology to provide a digital textile print service for short runs and production scale projects. We can digitally print on cotton, synthetic and silk fabrics. The printing technique is digital which allows you to print hundreds of colors and photographic images. Digital Textile Printing has various advantages. Any graphics which has been created for printing on paper can be printed on fabrics with the help of this latest technology. We can also create photographic and tonal graphics with multiple shades and colors using various software like Photoshop etc. on fabric for providing best & quality results. No limitation on number of colors: With this technique of printing, any number of colors can be printed in a design. No limitation on repeat size: Unlike repeat size limitation in traditional printing methods here a file/repeat can be as big as we want. Speed: It’s extremely fast, where everything that is required in the print can be prepared on computer. Once the files are ready it does not take more than a day to produce printed fabrics. No minimum order quantity: There is no restriction on the minimum quantity which needs to be ordered. Digital Textile Printing Solutions to all the imaginable fabrics including silk, cotton, wool, viscose, linen, rayon, jersey, synthetic. It allows you to print hundreds of colors and photographic images on your desired fabrics.